Unexpectedly (but not so much), DxO has released the new version of the much beloved and controversial Nik Software Collection. For those who missed the previous episodes, Nik Software is a company established in California in 1995 which has developed photo editing software as simple as they’ve been revolutionary. The combination of such characteristics was the reason why the suite was immediately loved despite its price which wasn’t really within everybody’s reach: 500$ for the complete bundle. Over the years, the company began to face the emergence of its first difficulties until it came to a stalemate in 2015, when there was a tangible fear concerning the abandonment of the project. Fortunately, Google took care to save us photographers by taking over the company and related software copyrights in 2016, first bringing down the price to 150$ and then making it free of charge. Basically, Google acquired the core technology of the software in order to implement it into its own editing application for smartphones, that is Snapseed, seeing (after due consideration) how the simplicity and potential of Nik would be the perfect solution to ride the wave of the “instant edit” fashion. The concerns of us photographers with regard to the actual continuation of its development for professional purposes came true in 2017 when Google announced the intention of abandoning the development of Nik. Panic. 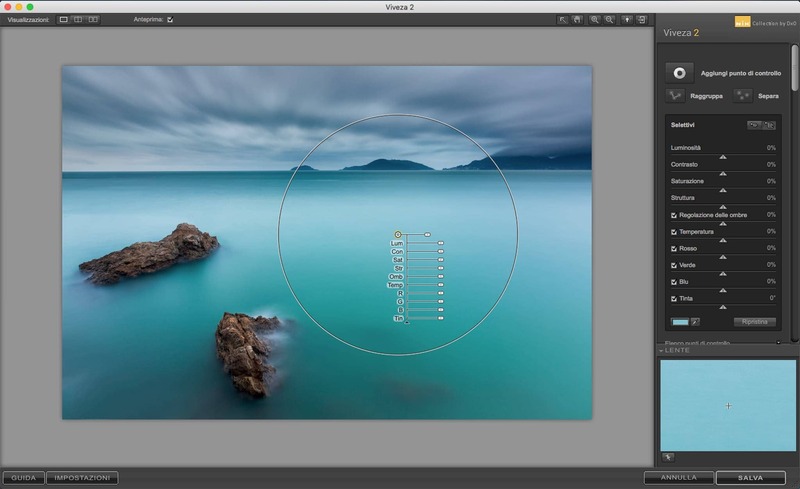 Even if the application worked really well and it didn’t really need any actual new features, our fear was that, over time, we would lose Photoshop and Lightroom plug-in compatibility, and in fact, the first problems began to emerge just a bit later. 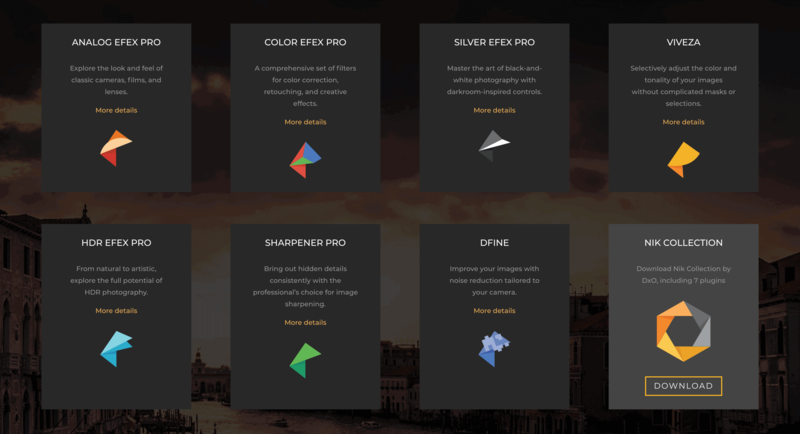 Towards the end of October 2017, DxO unexpectedly announced the take-over of Nik from Google, while promising to release a new version of the suite, aimed at professional photographers, in 2018. That moment has finally come, and on 6 June 2018 DxO announced the release of the “Nik Collection 2018 by DxO”. Each tool has been developed with a graphical interface that is always about the same, but their features are really different. Why so many separate tools and not one single application? We could give countless philosophical answers, but the most plausible answer is that in its original version Nik cost 500$ and in order to encourage purchases (or simply to increase sales) at some point they decided to sell the various applications individually (why to purchase a black and white tool when I’m only into colour photography?). While there’s nothing new with regard to the fragmentation of the application, the first thing we immediately notice is the price. In fact, although there is a full-featured trial version available, which you can use for 30 days, the Nik Collection 2018 by DxO has a price of 50$ right now while I’m writing this article (therefore about 42 €), and it will be raised to 69$ starting from the 1st of July. This has generated a little discontent in the world of photographers, which I absolutely do not share. Once you start using it, it will probably become a strong active part of your post-production workflow. Once you have downloaded the software, the installation process is straightforward and intuitive. If, like me, you also have the old Google version installed, the new Nik by DxO will just update what is already available on your Mac or PC. After opening and trying the various software applications, the first evident thing is that there is absolutely nothing new with regard to the graphical interface. All tools are identical to the previous version, in both the stand-alone and plug-in version. We can just notice a vague “by DxO” inscription next to the Nik logo, but really nothing more than that. So why should you pay for something that is already available for free (yes, the Google version can still be easily found on the web)? Simple: not only because it works, but also because it will certainly work in the future with the various Photoshop and Lightroom updates. If you’re a long-standing Nik user and you have also stumbled across the tragedy of some Photoshop update, you can clearly understand what I’m talking about. On the other hand, if you’re a new user, you will surely understand this when, in the future, your Nik by Google will stop working and will leave you stranded in the middle of a postproduction. The strategy of waiting until it stops working might work, but since Nik Collection by DxO has a discounted price for its launch, I would consider the option of taking advantage of it. Why is Nik Collection so beloved? The question is absolutely legitimate when it comes from those who have never tried this software. However, the answer is just as straightforward, and it’s called “U Point Technology”. Substantially, as the old Google guides perfectly report, Nik software makes use of control points to manage the changes we want to apply. These are designed to quickly create precise selections without having to resort to masks or complex tools. Each tool of the Nik Collection allows the insertion of specific control points that are adapted to the plug-in’s goal. For example, in Dfine the control points allow you to selectively apply noise reduction, while in Viveza they allow selective control over color and light. Each control points creates its own selection according to the color characteristics of the object on which the point is applied. These characteristics include red, green, blue, hue, saturation, brightness and position of the selected object. The U Point technology therefore automatically creates a selection based on the similarity of other objects and areas of the image with the selected object. 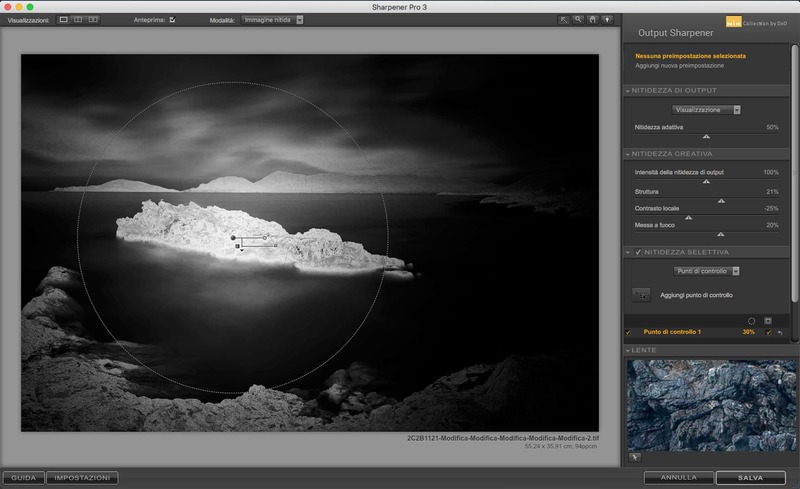 By adding more control points to the same image it is therefore possible to create ever more precise selections and simultaneously modify various parts of the image. In short, with simple control points, it is possible to manage rather complex changes. This is the reason why once you try the Nik Collection you will hardly do without it. Honestly, I couldn’t be happier about the Nik Collection 2018 by DxO. Yes, it’s the same as before, and I really thank all DxO engineers for this. 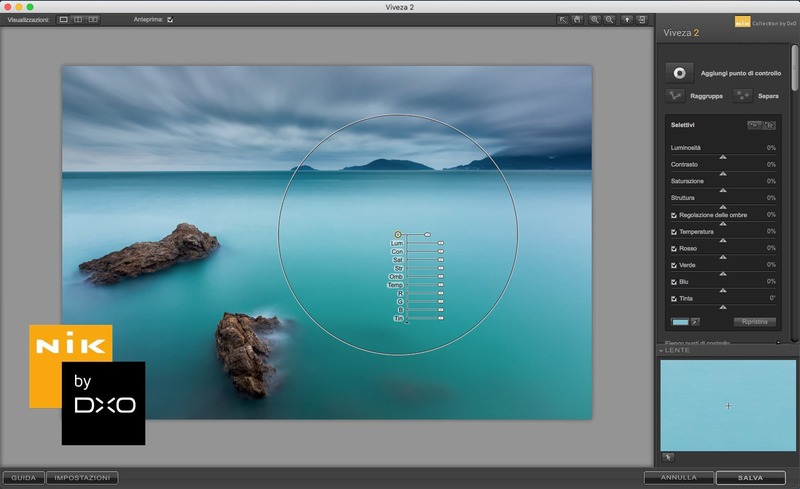 There’s a good reason Nik has been considered an absolute point of reference among photographic plug-ins since 1995, and knowing that at DxO they have decided to bring the software forward seamlessly, rather than destroying it for modifying it at all costs, it makes me infinitely happy. Of course I also hope that, in the future, new features will be implemented, but knowing that they will probably be introduced without altering the nature of the suite can just make me happy. If the thought of paying for this software application does make you turn up your nose, then just try to focus on the fact that you are investing in the future of this application rather than its present. Well done DxO, finally long live the Nik Collection! 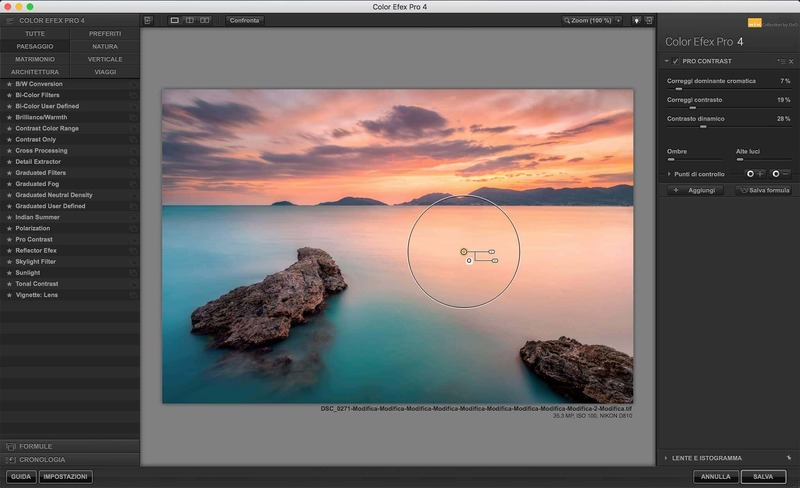 Learn how to use Nik Collection 2018! Intrigued by Nik Collection 2018 but not sure how to get the most of it? Ask for more information about my Skype lessons! I can guide you to get amazing results on your images!